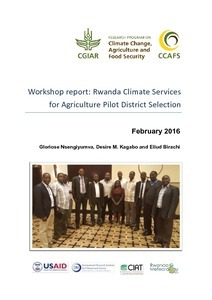 This report presents the outputs of the site selection workshop that brought together experts and users of climate services for agriculture in Rwanda. The aim of the half-day workshop was to introduce the Rwanda Climate Services for Agriculture project to key partners and identify four pilot districts to start with during the first year of the project’s implementation. The pilot districts were identified based on key criteria set by the project team with participants adding their views. The criteria were set in a way that will lead to quick wins by the end of the first year of the project’s implementation. The selected districts include Kayonza located in the Eastern agro-ecology, Nyanza located in the Southern agro-ecology, Burera located in the Northern agro-ecology, and Ngororero from the Western agro-ecology. The report summarizes also the recommendations from the participants and the way forward. Nsengiyumva G, Kagabo DM, Birachi E. 2016. Rwanda Climate Services for Agriculture project workshop with high-level key partners for pilot sites (districts) identification, Kigali, Rwanda, February 2016. CCAFS Workshop Report. CGIAR Research Program on Climate Change, Agriculture and Food Security (CCAFS). Copenhagen, Denmark.